Hot off the press: accepted manuscript in Chem. Commun. Written by Anna May on March 11, 2016 . Posted in New publications, News. Today is the big day: second manuscript accepted! The manuscript “A silica-based magnetic platform decorated with mixed ligand gold nanoparticles: A recyclable catalyst for esterification reactions” (Elif Ertem, Nerea Murillo-Cremaes, Randy Patrick Carney, Anna Laromaine, Emma-Rose Janeček, Anna Roig* and Francesco Stellaccia*; DOI: 10.1039/C6CC01146B) has been accepted in Chemical Communications. 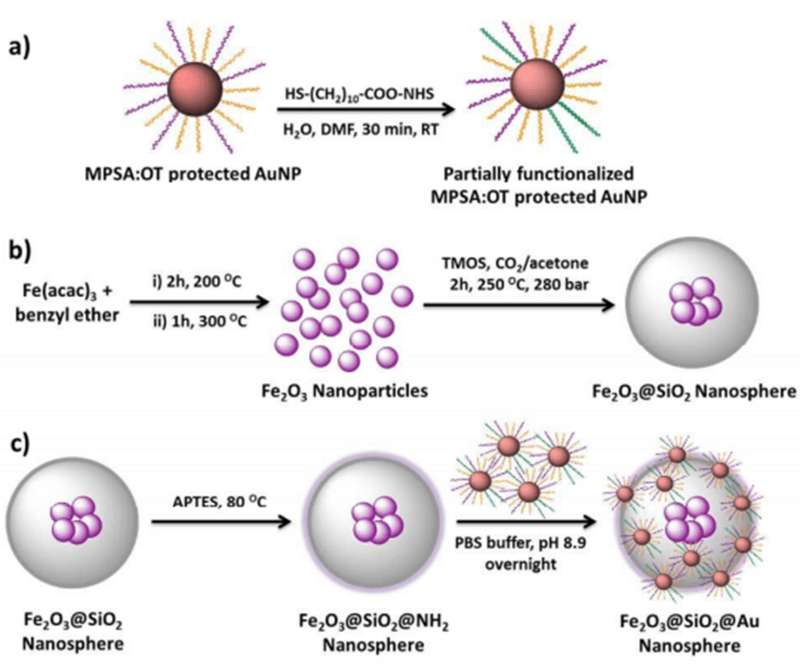 This paper describes a novel and convenient synthetic strategy for the preparation of magnetically responsive silica nanospheres decorated with mixed ligand protected gold nanoparticles. Gold nanoparticles are attached to the silica surface via stable amide bond formation. The hierarchical nanospheres show promising results as a reusable and efficient catalyst for esterification reactions and they can be recovered through a simple magnetic separation. Figure: Schematic illustration of: (a) the partial ligand exchange of 3-mercapto-1-propanesulfonate (MPSA):1-octanethiol(OT) covered gold nanoparticles, (b) the synthesis of core-shell magnetic silica and (c) the synthesis of the magnetic silica decorated with gold nanoparticles hierarchical nanospheres.